After stealing a necklace from a museum, Catwoman receives a two-way video communication device. The Joker is on the line, offering her a plan to steal England’s crown jewels in exchange for her stealing a small object for him at the same time. She agrees, and heads to London. When the theft is detected, a card with a Bat symbol is found, enticing Batman to follow. As Bruce Wayne, he gets a tour of the security measures. As Batman, he determines the jewels were never stolen, only hidden nearby. Using the media, he goads Catwoman into returning. He tells her he knew she would be back to steal the jewels once the security was disengaged. A chase ensues. Batman recovers the loot, but Catwoman gets away. And Joker gets his prize. After a great start with issue #1, this issue falls to the expected level of tie-in books. The heist itself is moderately clever, but it’s cookie-cutter otherwise. Catwoman acts completely out of character, though that could be attributed to the writers not being privy to her early episodes yet. That aside, it’s still a lackluster story. I also take issue with the title, as there’s not even a hint of killing involved. Given how out of character Catwoman behaves, this story doesn’t really fit into the established continuity. (And she’d never listen to Joker like that.) 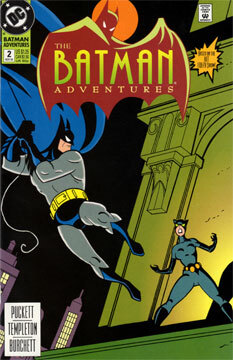 I might find this tale more interesting if it was set a few years later during The New Batman Adventures. Even then I’d be hard pressed to accept it.